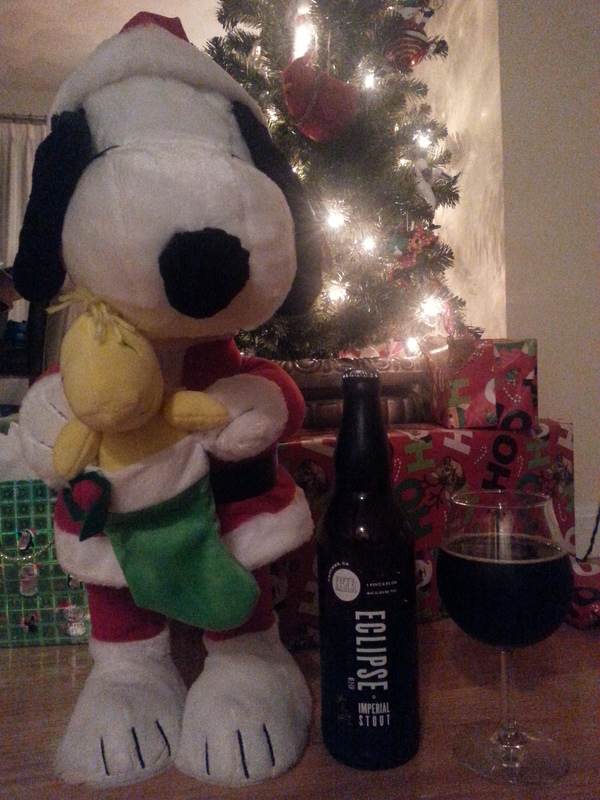 Don’t misunderstand, there is absolutely no right or wrong time of year to reach for a nice big Stout. There’s just something about the winter that makes them seem a little bit more satisfying. Despite having unseasonally warm weather the past few days, I am just about ready to go on a bit of a stout spree. Starting things off was one of the goodies my wife left me under the tree this year, You Enjoy My Stout, by Cambridge Brewing Company. Description: According to the official brewery description, this release was initially brewed back in January and left to age in Buffalo Trace bourbon barrels for 10 months. The flavors are described as a mixtape of malts, vanilla, coconut, fruits, and espresso. Pour Info: Poured from a corked and caged bomber into the usual snifter glass. The cork came off with a satisfying loud pop. Appearance: Poured a dark black body, with a two finger head the color of chocolate milk. The head was fluffy and slow to dissipate, leaving a thin foam atop the beer throughout the drinking experience. Smell: The beer smelled of sweet from malts and dark fruit, with a strong bourbon heat lurking in the background. At warmer temperatures, the bourbon became more pronounced. Taste: As this description suggests, this beer had a rather complex taste. There was a strong bourbon presence throughout, though it was most prominent upfront and at the finish. Mixed in were traces of chocolate and espresso malts towards the start, and a tart, fruity taste closer to the finish. The beer drank hot the entire time, making the overall taste something not entirely unlike a slightly roasty, chocolate and tart fruit bourbon jam spread. At is it left to warm up, the bourbon comes through more and more, making this one pretty intense. Mouthfeel: The mouthfeel was not at all what I would have expected. While the body was on the thicker side overall, there was a moderate amount of carbonation that threw things out of balance for me. The bubbles often got in the way of enjoying some of the subtleties of the taste, which I think did the beer a bit of a disservice. The carbonation did settle down a bit as the beer warmed, but at that point the other tastes had more competition from the bourbon. Hype Factor: I’ve had my eye on this beer since last year and was looking forward to getting a chance to try it out. It’s also fairly well-regarded, so I’ll say I was eager give it a go. Overall: A very good tasting beer with a semi-tragic flaw in that the mouthfeel was just a bit too bubbly for the style. The beer based on its taste was fantastic, provided of course you like bourbon, but the carbonation got in the way of fully enjoying that. If this had been much lower carbed and smoother, it would have been phenomenal. But instead I am left conflicted. I would totally order this again as part of a flight at the brewery, but I don’t think I’d take down another bomber alone. Worth checking out if the review sounded interesting, but be warned it might not quite drink like you’d expect. 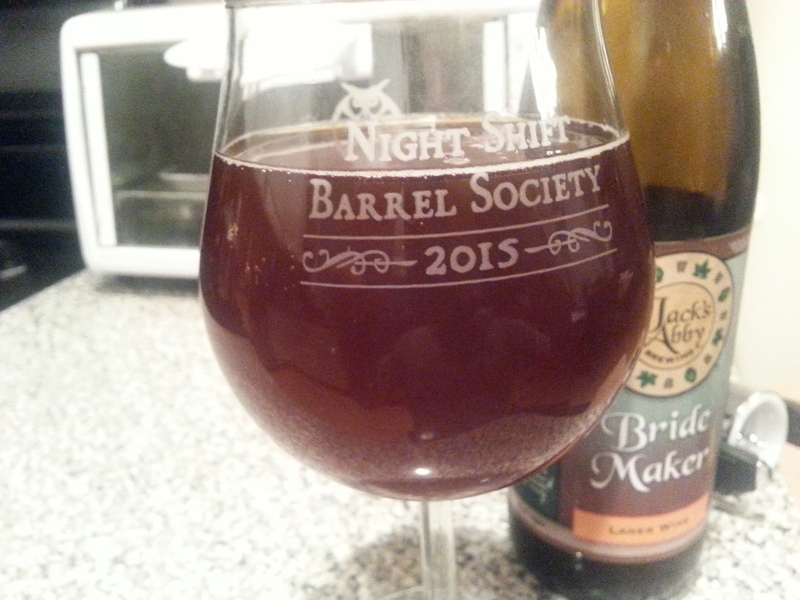 I was in the mood for something different so I reached into my trusty beer closet and came out with a little something I picked up earlier this year – Bride Maker by Jack’s Abby Brewing. Description: I picked up this bottle right from the source back in April, but it had been bottled on 09/12/2014. Pour Info: Poured from a refrigerated 0.5 L bottle into that snifter glass which has been getting so much action this year. Appearance: Poured a brownish caramel body. Not much head to speak of. Smell: Malty and sweet with some serious rum notes. Taste: This big beer certainly delivered some big tastes. Primarily sweet and malty, these base flavores mixed with caramel, toffee, rum, and dark fruits before coming to a moderately hot, boozy finish. These all blended together really well to make this a dangerously smooth drinking beer despite all the intensity. Really lent itself to being slowly savored and enjoyed. Mouth Feel: It had syrupy, thickish body that felt kind of slick. Minimal carbonation. Hype Factor: Moderate. This was a beer I got to try at last year’s Extreme Beer Fest, but not necessarily appreciate since I had it at the end of my session. Overall: A very tasty beer, but a slow sipper for sure! I really liked the sweet flavors of the beer and the warming effect the finish had. Excellent beer for a cold December evening. I have a hard time passing up Imperial Red Ales (or Red IPAs, or Hoppy Amber Ales, whatever you want to call them). I’ve said it before on here, this is probably my favorite style of beer and I am always on the lookout for a new or exciting offering in this style. 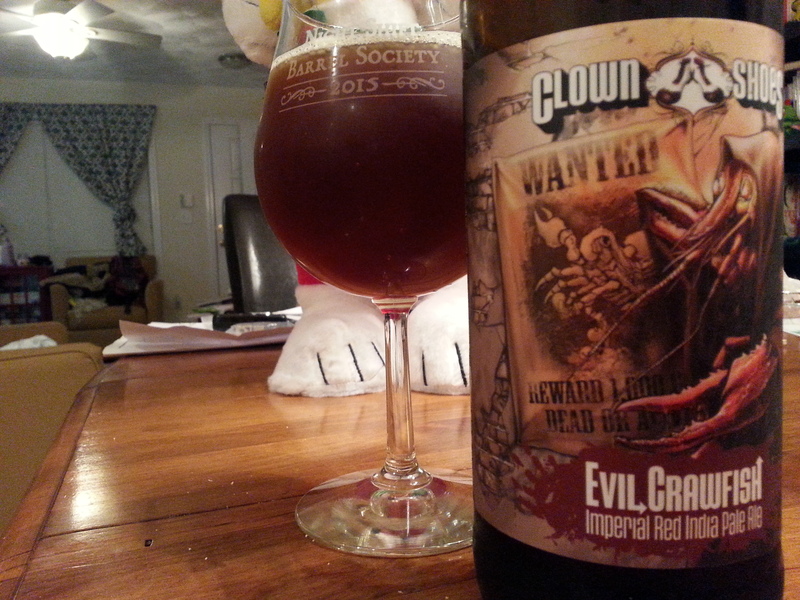 So when this beer caught my eye (and with a typical Clown Shoes label how could it not?) I knew I had to go for it. Description: Described as a cleaned up version of one of their previous beers, dry hopped with Citra, El Dorado, and Mosaic. I lost track of the exact bottle date, but I do remember it being consistent with the announced November 2015 release date. Pour Info: Poured from a refrigerated 22 oz. bottle into the snifter glass. Appearance: Dark caramel/amber brownish body with a quick to dissipate foamy off white head. Smell: Lightly sweet and bitter hops. Taste: Very similar to the smell. Bitterness comes mostly upfront and is pretty much an equal mix of pine and citrus. A bit of malt sweetness picks up on the finish but over the beer is decidedly more hoppy than malty. Mouth Feel: Medium bodied like you’d expect out of an IPA with just a touch more carbonation. Hype Factor: No hype, but I do tend to look for a very particular flavor profile when picking up this style. Just my own preferences on this one I guess. Overall: I found this beer to be good, but not necessarily great. As an IPA, it has a flavor profile I think a lot of hopheads would enjoy and it’s $6.99 price point certainly makes it a good deal. However, I am picky with this style and would have preferred a more assertive caramel malt presence, even if it meant dialing back the hops just a little bit. Different strokes for different folks. Pick one up if you’re intrigued. Celebrating this festive evening with one of my most delicious gifts from last year. Cheers to a happy holiday season! 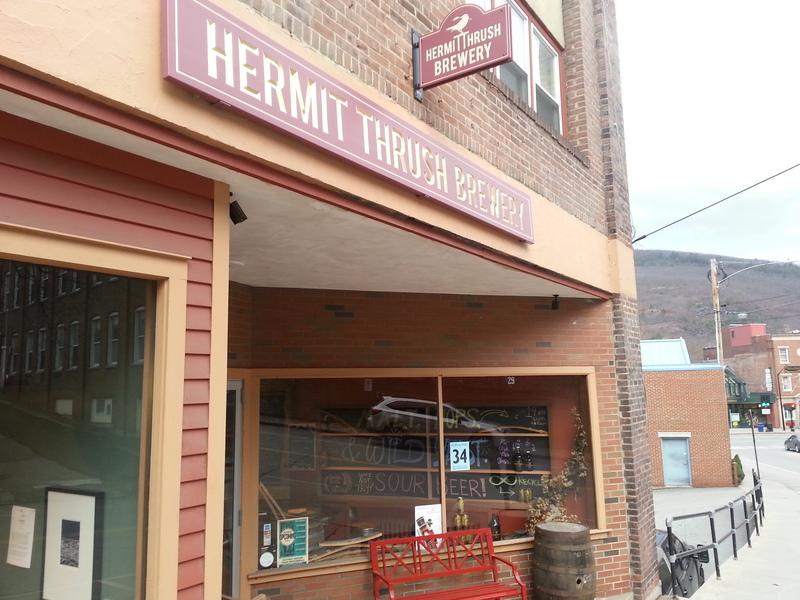 Last weekend I found myself headed to Brattleboro, Vermont for a day trip, so I took advantage of this opportunity to check out Hermit Thrush Brewery. Although the brewery has only been open a year (and I was honestly unfamiliar with them before planning the visit), I could not have been happier with my experience. Hermit Thrush is doing a ton of things right and it is with great joy that I am able to provide a recap of my visit below. I’ll start with the ambiance. The brewery was located in a commercial storefront near the center of town. Inside was spacious and a lot larger than it appeared from the street. Most of this space was devoted to well-organized brewing and storage areas with the drinking action taking place around a cozy bar area and a few tables on the right side of the floor. The decor had a rustic New England feel, with lots of wood beams and barrels. The bar further incorporated this aesthetic with an old-fashioned glass cleaning system in place; scrubber brushes to soak sink to rinsing basin. A pair of record players behind the bar seemed to perfectly complete the experience. Everything about the place just felt happy. The staff also did their part to make you feel welcomed. 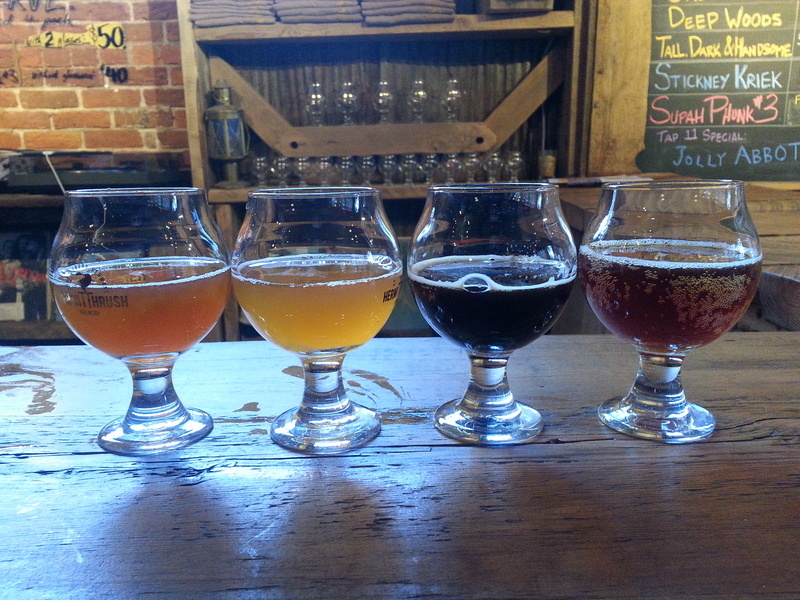 They were eager to talk about their craft and were extremely knowledgeable and happy to go into any topic at all, be it the barrel aging process, cleaning glassware, or the joys of pairing up sour ales and food. You could tell they genuinely enjoyed what they were doing and loved being there. Co-founder Christophe Gagne was even at the corner of the bar hand labeling cans and chatting. Very cool experience and very nice people. And then there was the beer. They had 11 pouring that day, ranging from good to absolutely fantastic. Their specialty and main area of interest was creating Belgian inspired sour ales, something they certainly seem to have a calling for, and they offered an excellent variety. 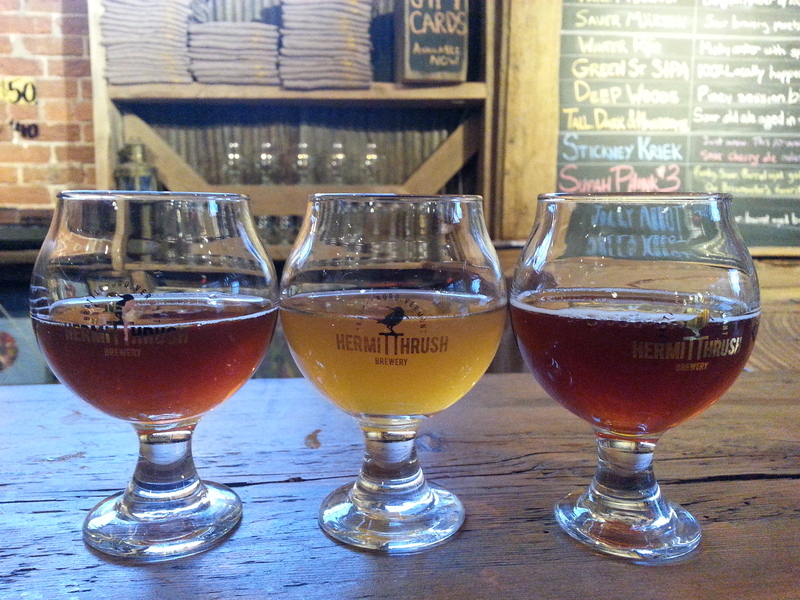 The sampling options were broken up into three convenient flights of deliciousness. The first flight covered what seems to be their main lineup of offerings. Going from left to right, I started with Brattlebeer which was a 5.2% Sour Apple Ale that smelled a lot like a glass of fresh apple cider. There was a huge apple taste right from that start with a little bit of a sourness towards the end. Based on the smell you would think this beer would end up being really sweet, but the finish was actually more on the dry side, which I certainly appreciated. They set the bar high right off the bat with this one. 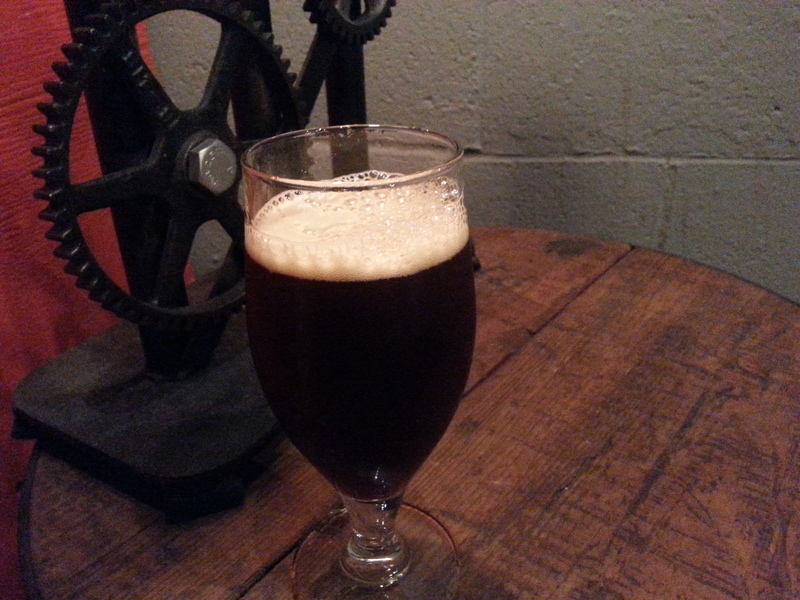 Beer number two was Brooks Brown, a 3.8% brown ale. The taste of this one had roasty, peppery, and slightly nutty character. Nothing wrong with this one, but as I’ve mentioned before, this isn’t really my type of beer. Moving on, I came to Tardy Harvest, a 6.6% amber ale brewed with pumpkins. This is another one I wish I had around for my pumpkin beer tasting and rivaled those I had a Cambridge Brewing Company last month. It had nice sweetness to it, with a subtle pumpkin taste mixed with just a hint of fall spices mixed in. Closing out the first flight was Sauer Marzen, their take on a German favorite. Checking in at 5.8%, this is another beer I wish I had around for the fall season. A little bit sour upfront, it had a sweet malty body that was really quite wonderful. With one flight down, things were looking pretty good. 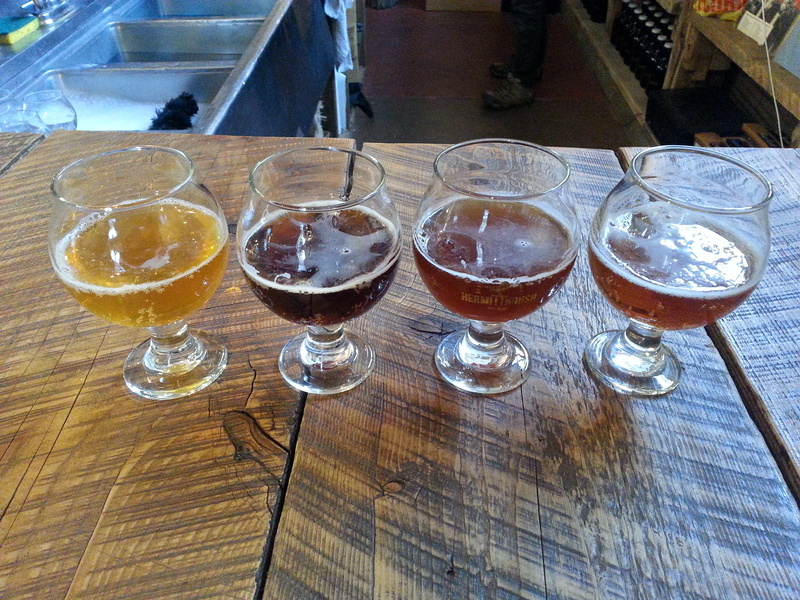 The second flight introduced me to some of their more experimental beers. Like the first flight, it started out on a high note with their Winter Rye. This was another amber style ale with a nice sweet malty presences upfront that transitioned to a somewhat spicy rye finish. It was also a seasonally appropriate 6.4%. I don’t always go for rye beers, but I was a huge fan of this. The next beer up was a 6.8% Sour IPA called Green Street SIPA that was also quite amazing. It had lots tangy/sour citrus fruits upfront. The bitterness was more on the finish and more malt-balanced than your typical Vermont IPA, but make no mistake, this beer was nothing short of amazing. Beer number three was a Black Session IPA called Deep Woods. Despite being only 3.4%, this was an intensely piney experience, kind of like licking a pine tree in the middle of the woods on a cold winter day. I think it was perhaps a bit too one dimensionally piney for my tastes. 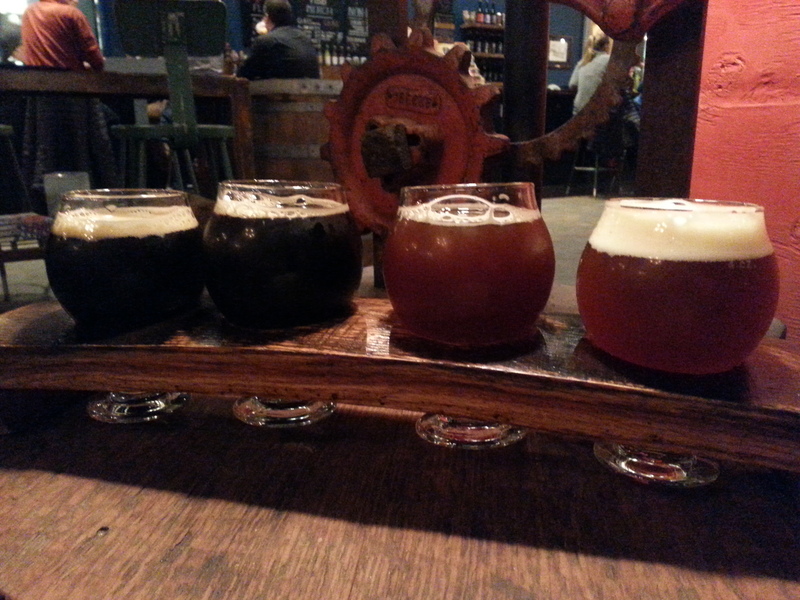 Rounding out this flight was a 7.9% fruit barrel aged old sour ale called Tall, Dark, and Handsome. The taste of this beer was amazing! Cherries and dark fruits started things off, and there is a moderate funky tartness and sweet malt presence that really takes this beer to the next level. I was officially impressed at this point by what was turning out to be an exceptional tasting experience. When the third flight came around, I knew I was in for something special. The last three beers were all special or limited offerings that the brewers took particular pride in creating. At this point, I was game for anything they were pouring. First up was Stickney Kriek, a 5.8% sour cherry ale barrel aged for 10 months. This was maybe even better than the previous cherry influenced beer. Sour tart cherries up front and just a little bit of hot, sweet finish. Next up was Supah Funk #3, a sour Saison. It was a very light and clean tasting Saison, listed at 5.9%. It balanced a moderate yeasty funk with a sour tang quite well but for me it lacked the shine of some of the previous beers. Part of that opinion is my feelings on Saisons, and the other part is just a testament to how spoiled I’d been up to this point in the afternoon. And lastly, Jolly Abbot came in for the big finish. Lurking at the end of the tasting was this 13% sour barrel aged Barleywine just waiting to say hello. It had the great caramel malty sweetness of a Barleywine, the tangy sourness of a wild ale, and an excellent hot bourbon-like finish at the end to keep you warm on a cold day. Fantastic, simply fantastic. I was hard pressed to pick a favorite beer from each flight, nevermind a favorite overall. I was thoroughly impressed by the range and sophistication of the beers being offered here. 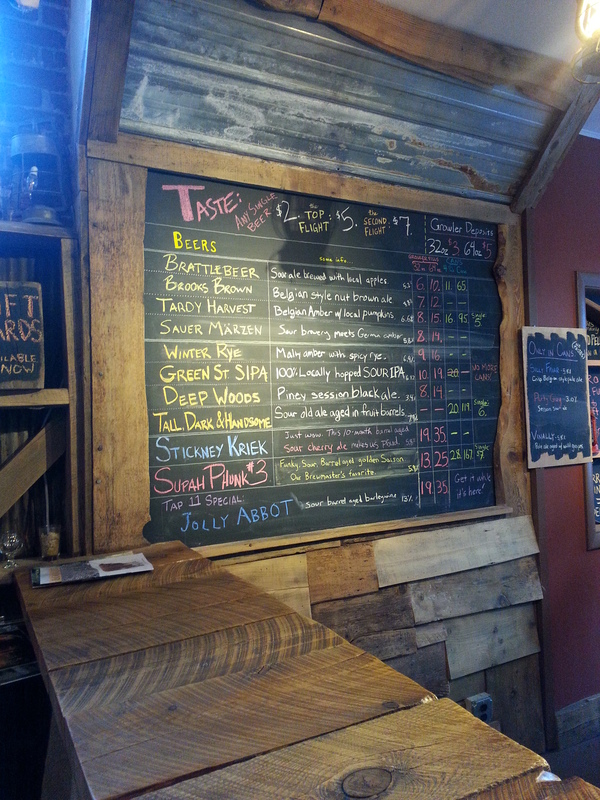 Add in the charm of the taproom and friendliness of the staff, and this place is a no doubt winner. I went in not really knowing what to expect and left ecstatic that I was able to visit. What a great time. Considering this place is only a year old, I imagine great things in their future. Mark this one on your map of New England breweries for sure! I finally got around to seeing Star Wars: The Force Awakens today and couldn’t resist taking the time to write down some quick impressions. I was shocked and extremely grateful that I made it through the opening weekend without being exposed to any spoilers so I will extend to you all the same courtesy. While I do not discuss any plot points below, I don’t want to be the jerk that inadvertently ruins something for a reader that hasn’t seen it yet. Everything after the break is to be read at your own risk. It feels like it has been forever since I’ve posted a beer review. Fortunately, the lure of the penultimate 2015 Barrel Society release brought me back to Night Shift for another round of tastings. As usual, there was plenty to choose from. I started things off with a full pour of the main attraction. Rubens was described as an 8.0% Belgian Dark Ale aged in oak barrels with cherries, cacao nibs, and coffee beans. It poured a deep brown body with some bubbly off-white foam gracing the top. The smell was a bit sweet, but otherwise didn’t give away much as to the joys that were about to follow. The taste was quite rich, primarily carried by sweet toffee malts and cacao nibs accompanied by hints of coffee, cherries, dark fruit, and the slightest bit of Belgian-style yeast and malts on the finish. The finish was a touch warm as the beer sat for a while, something I think made it all the better. Mouthfeel was on the thicker side, with slight carbonation. I really enjoyed this. Favorite Society beer of the year so far. Fantastic. Given this high praise, the flight that followed this had a lot to live up to. I started out with Silvius, a 7.2% Dubbel. As expected, it poured a tannish body with a healthy off-white foam head. Taste was bubblegum yeast and a bit peppery. Solid representation of the style, but this wasn’t really a beer that excited me. Not my thing I guess. Following up on this was Strix, a huge 11.0% Barleywine. This one got my attention. It poured a dark tannish/brown body with a thin white head. It had an inviting sweet, cotton-candy like smell that I really liked. As for the taste, there was tons of toffee, caramel, burnt sugar, and dark fruit going on before coming to a warm and (surprisingly) lightly bitter finish. I liked this beer, but if it lost that bitterness at the end I would say that I loved this beer. Next up was Relajo, a 6.4% Coffee Stout. It poured about the way you’d expect, dark body and thin tan head. The taste was dominated by roasted coffee with hints of hazelnut in the background. This roast was quite strong actually a bit too much for me personally, but if that is how you like your Coffee Stouts go on and seek this one out. Closing out the flight was another coffee stout called Check Raise brewed by Idle Hands. Clocking in at 6.4%, it appeared almost identical to the previous beer. The taste, however, was worlds apart and not quite what I was expecting. It tasted something along the lines of a Pale Ale/Coffee Stout hybrid with a fruity, sweet bitterness upfront that gave way to coffee towards the finish. As the beer warmed up a lightly roasted coffee flavor did come out a bit more, but the sweetness never quite went away. This was an odd beer. Not necessarily bad, but definitely odd. Well that wraps up another trip to Night Shift. I will probably be back soon to pick up the final Barrel Society release in a week or so and have the year-end members party coming in January to look forward to. Hurray beer! Back again with another book, which is perhaps doubly exciting since it happens to be a book about beer. Today we are looking at Boston Beer: A History of Brewing in the Hub, by Massachusetts-based beer blogger Norman Miller. While I was not particularly familiar with Miller’s column, I have definitely heard his name in my beer journeys. My most memorable impression of him is probably through a beer Wormtown Brewing Company puts out in his honor. Simply named Norm, this fantastic Chocolate Coconut Stout came about as close to drinking an alcoholic Mounds bar as one may ever get. I definitely recommend trying this if given the opportunity, but from here on out this post is all about the book. I had a lot of fun reading this. At only 134 pages it’s short and sweet and packed with a whole lot of interesting information. It came out very recently, published in 2014, and covered the Boston brewing scene from colonial times to pretty much the present day. The first few chapters touched upon the colonial period through the late 1890s and the build up to Prohibition. It moves fast through these sections but the information was all well selected and stuff I found interesting. The book then made a jump to provide brief histories of Boston’s active resident breweries: Boston Beer Company (Sam Adams), Harpoon Brewery, Boston Beer Works, and lastly Trillium Brewing Company. There was also a chapter in there about the breweries that came and went in a wave of craft beer during the late 1990s to early 2000s. There were so many interesting stories to be told in such a small amount of space that I found myself often scribbling down notes about things to look into further. All in all though, I think it presented just the right amount of information to engage the reader. It was perfect for someone like me who was curious to know a bit more than what a good brewery tour guide will tell you but wasn’t necessarily looking to get too bogged down. I went through this fast, only needing a few train rides to finish it. There were a few things I particularly liked about this book. It may sound kind of silly to say this, but I was simply struck by someone talking about Boston and actually meaning the City of Boston. A lot of times around here “Boston” is used to encompass everything from the surrounding suburbs and Cambridge, the entirety of Eastern Massachusetts, or even coastal New England from Portland, ME to Hardford, CT. As for the city itself, I started a list of old brewing locations that I want to check out for some photography adventures. Other than the Sam Adams facility in Jamaica Plain none of these remain entirely intact, but I am intrigued to see what may be left behind in some of the spots that got mentioned. As for the brewing aspects, I found it interesting to find out more about some of the people who worked here in the earlier parts of their careers; guys like Todd Mott (formerly of Portsmouth Brewing Company fame and currently at Tributary Brewing Company), Phil Leinart (Brewery Ommegang), and John Kimmich (Alchemist Brewery), just to name a few. I also had no idea that the Boston Beer Works was so influential to the modern Boston brewing scene. I’ve always kind of taken them for granted as the crowded chain brewpub outside Fenway Park, but now I think I have a new perspective. This was also a rather timely read as there were a number of great quotes near the end from Dan Paquette, who recently announced an ending to his Pretty Things Beer & Ale Project, that seem even more insightful in light of his recent decision to pursue other opportunities. Details and insights like these really made the book for me. I enjoyed reading this and would recommend it to anyone local to the Boston area (however you want to define it) and interested in beer. It was fun, easy reading that presented a lot of really cool information. Cheers to Norm! 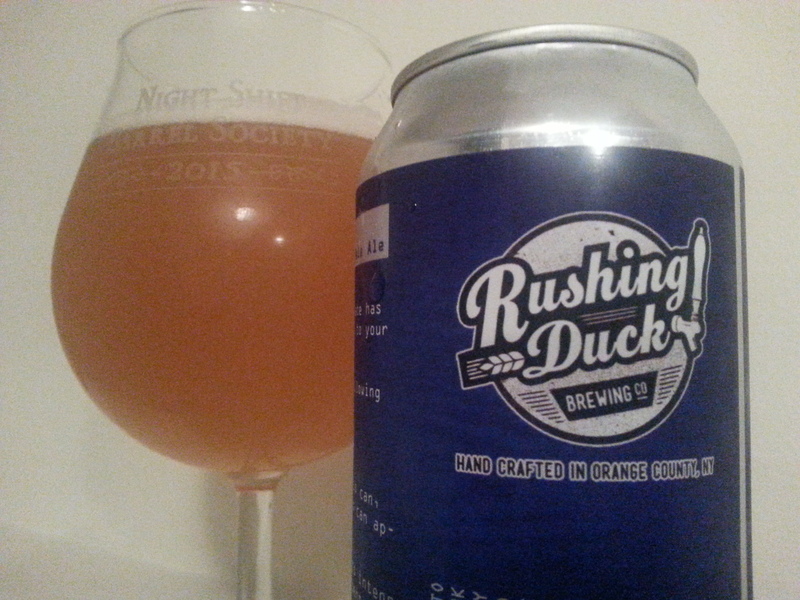 Last weekend I was introduced to Rushing Duck Brewing Company from Chester, NY when a friend gifted me one of their cans. I didn’t really know a lot about these guys beyond seeing a check-in to them every now and then, so let’s break out a long form review and see what kind of first impression they made. Description: Their website described as a West Coast-style IPA, brewed with Pilsner malts and a mix of Citra, Mosaic, and Simcoe hops. The can calls it an “Imperial Session Pale Black Indian Pale Ale.” I see. Well, it is most certainly the former. Pour Info: Poured from a refrigerated 16 oz. can into a snifter glass. Appearance: Pour was a cloudy pale yellow body with a bit over a finger of foamy white head. Smell: As soon as I opened up the can I got a nice burst of tropical fruits and a hint of piney hops. Taste: The taste was a sticky sweet mixture of hops and tropical fruits, pineapple in particular. Upfront the beer was mostly sweet and it picked up some subdued, resiny hops as it went on. The hops never really took over the sweetness, but were definitely apparent throughout the beer. Mouth Feel: I found this beer a bit thicker than I might have expected, on the upper end of medium. Carbonation was on the lower end for the style. Hype Factor: Curiosity levels were elevated due to the circumstances in which it was received. Overall: A mighty fine beer, but I have could have done with just a bit more bitterness to this one. While I wouldn’t rate this in the upper echelon on account of that, it is certainly something I would try again.